Update your wardrobe with hot Animal print. 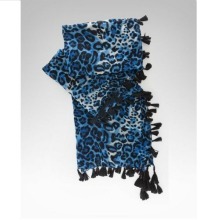 This bebe scarf features vibrant Cheetah print with cool tassel detailing and light wear. Whether it’s a dress or a casual-chic outfit, this fashionable scarf is sure to add a punch of wild style.